Many folks we know, think a hash brown is mash potato fried in bread crumbs. What ever that is, and however that tastes - 'It aint no real hashbrown' as Grandma Dorothy from Alabama used to say. Raw potato shredded, and seasoned, the water extracted and then fried over a skillet. 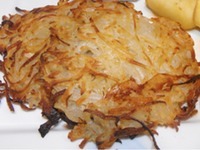 Now that's a 'real hashbrown', delicious with cooked breakfast.